It has just been announced that George Groves will defend his Commonwealth Title against former World Champion, Glen Johnson. Johnson retired earlier in the year after losing three fights in a row, two of those defeats came to world champions, Lucian Bute and Carl Froch. The other was a wide unanimous decision points loss to Polish Light Heavyweight prospect, Andrzej Fonfara. Well just months after being retired from the sport, Johnson will return for what should be, his last chance to get himself into world title mix. For Groves, this is a chance to show the fans how good he really is. Stopping, or even hurting someone as tough as Glen Johnson would be a huge statement to make. I think Groves should take this on points, nobody stops Glen Johnson, but if Groves stands and trades he could be in trouble. I see Johnson having his moments early but losing a competitive decision. Stephen Geal - "I think its a good challenge for Groves, it will be a great fight." "If Groves keeps to a game-plan that Adam (Booth) sets for him I could see Johnson get hurt but to be honest not really." - When asked whether Groves could stop Johnson. Toby Epsom - "This is a good move. Though on the wane, Johnson is tough and he's still a name in the US." Sam Bill - "Groves is getting him at the right time will be a good test for him but one I think he will pass." "I'd be getting BoxNation to see that." Ryan Walton - "Think its a decent fight, Groves should be able to hit and move but Johnson will try and walk him down, looking forward to it!" Jamie Ellison - "Good fight, especially as Groves has been inactive. That said Johnson is getting on a bit now so George should win handily." Sean Wood - "Good fight for him I think, bit of a name, could out-box him and stop him late. Could make a big statement." Olly Ryde-Rogers - "Johnson will come forward all day and is very durable. Definitely Groves' hardest fight to date but expect him to win. Late KO." Thanks for all the reply's on Twitter. So the popular opinion is that Groves should win if he sticks to a game-plan, but Johnson is always dangerous. 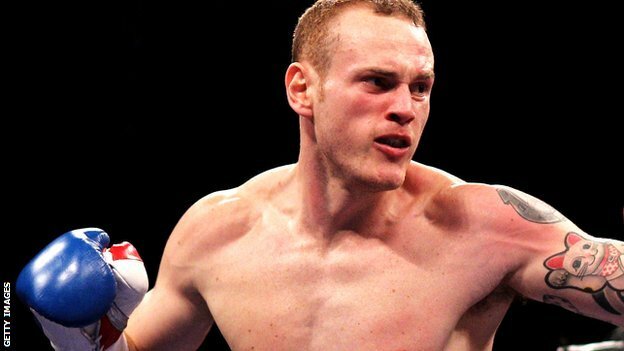 Groves will have only fought twice this year, but he's facing tough opponents at this stage of his career. This should be a good learning fight for Groves to prepare him for world class opposition. Does Glen Johnson have one last upset win in him? Or will Groves' youth and boxing ability be too much?